The coming days will be extremely hot in the Marne-la-Vallée area and therefore it’s important to stay cool during your Disneyland Paris trip. Today marks the National French Holiday – Bastille Day! Let’s celebrate this with a selection of photos of some of the most impressive Disneyland Paris fireworks displays. 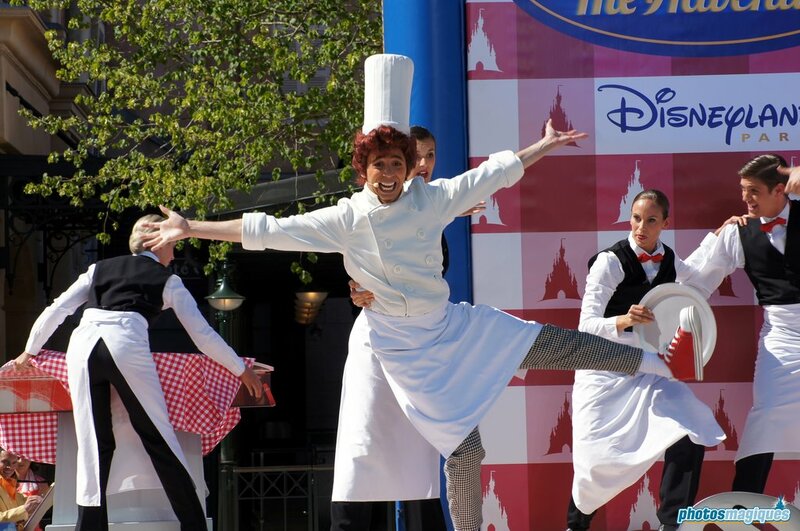 Bistrot Chez Rémy is the first table service restaurant in Walt Disney Studios Park and the largest of Disneyland Paris with its seating for 370 guests. It’s probably also one of the highest themed with oversized props and special designed furniture. 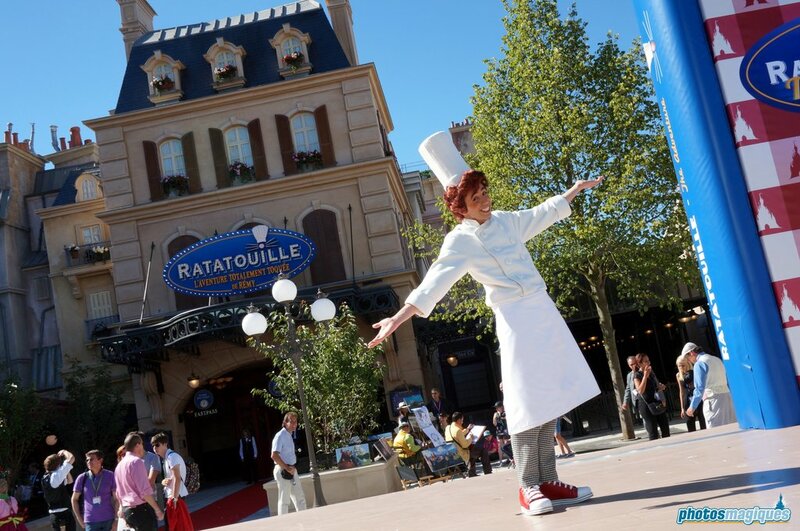 Bistrot Chez Rémy can be seen from the unloading station of Ratatouille: The Adventure. A giant glass window separates the attraction from the dining room. 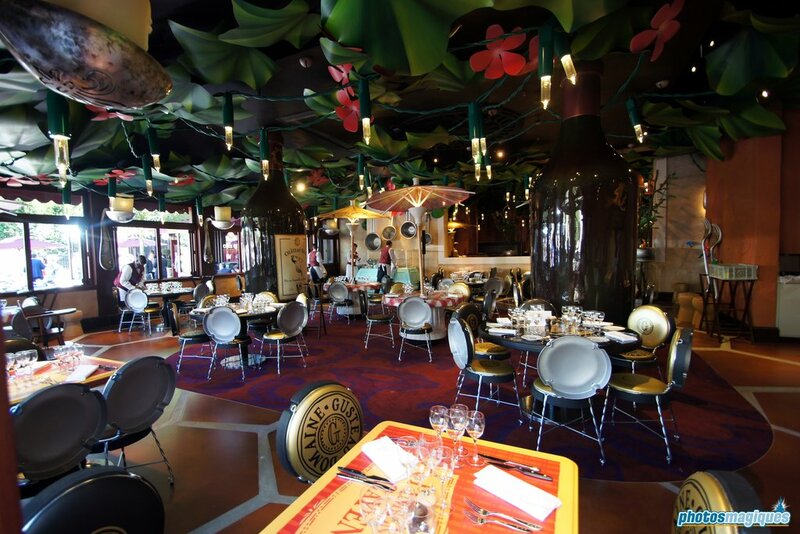 Blue Lagoon and Bistrot Chez Rémy are the only Disneyland Paris restaurants that can be seen from inside an attraction. 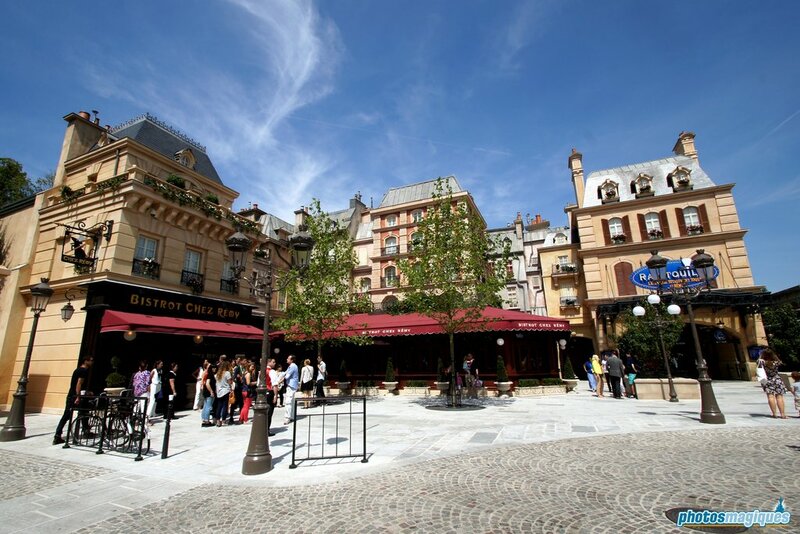 The restaurant is located in the corner of La Place de Rémy. 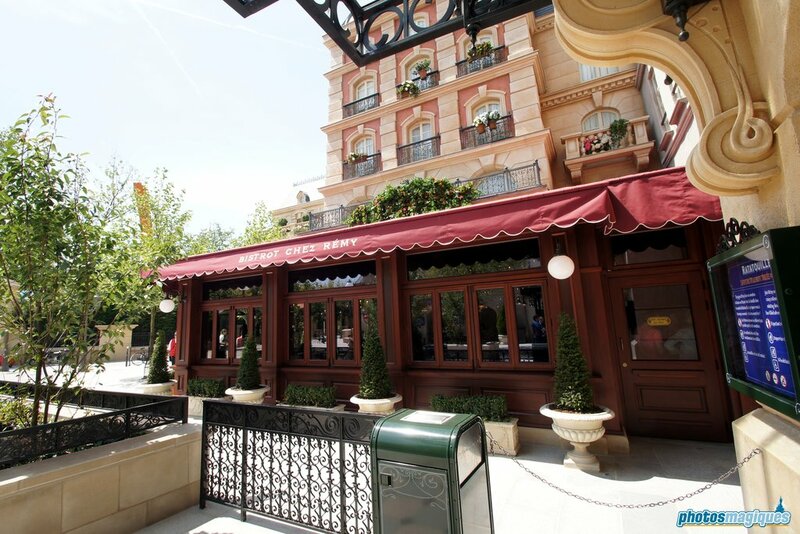 Besides featuring the main dining room, there’s also a veranda that gives a view on the Paris-themed square. In the original plans this was supposed to be uncovered, but Imagineers quickly realized the Marne-la-Vallée weather would not be suitable for this. When entering the restaurant, the theming and props are still regular guest size. Large couches give guests the opportunity to wait for their table. Numerous awards that Chef Rémy won for his cooking skills can be seen on the wall. Behind the cast member desk a framed 5 euro bill can be seen which, according to the story, is the money Rémy received from his first customer. Entering the main dining room, the theming changes drastically. 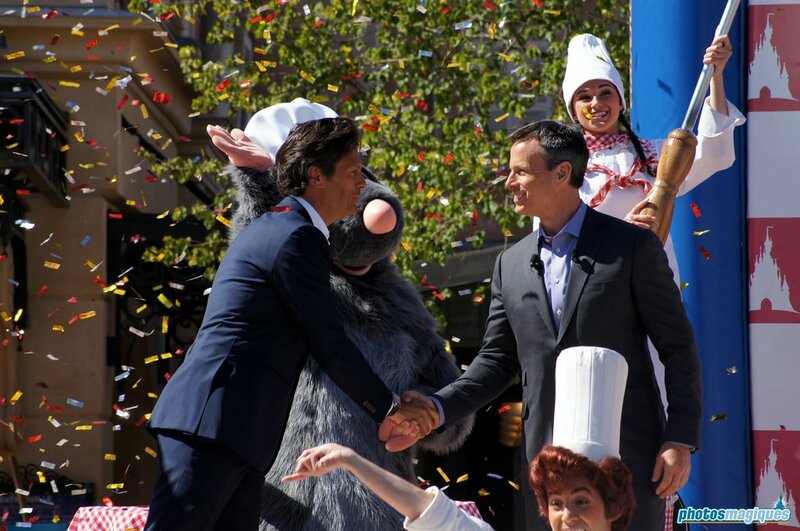 Guests are now the size of a rat. 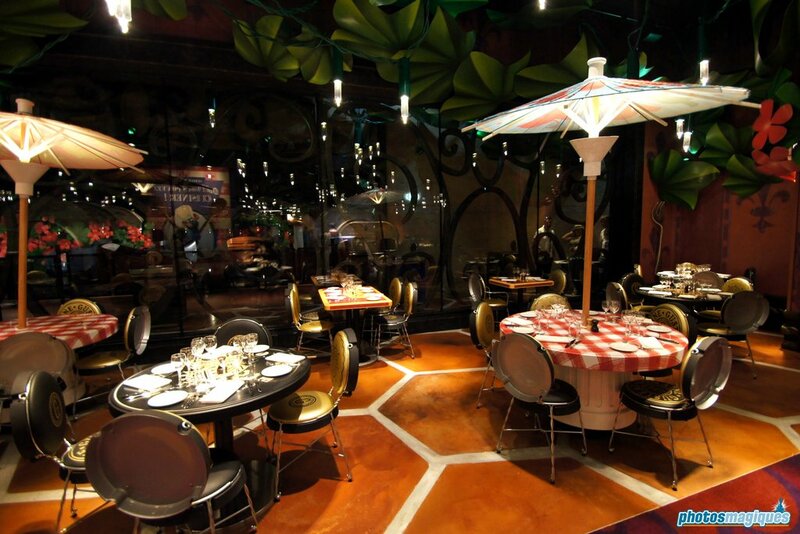 The dining room resembles Rémy’s restaurant as briefly seen in the last scene of the animated film Ratatouille. The ceiling is covered in hundreds of green leaves and flowers. Lighting is provided by large Christmas lights (unlike the ones at nearby Toy Story Playland, these are “European” style). The furniture resembles everyday human items but enlarged hundreds of times. 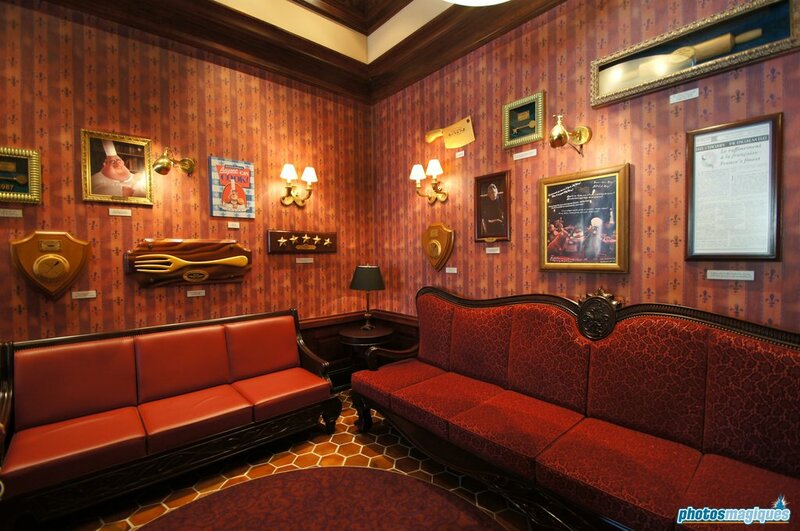 Guests don’t dine on ordinary tables, instead everything was custom designed by Walt Disney Imagineering. Table tops resemble large jam jar lits or olive oil cans, while the chairs look like the iron baskets that go over a champagne cork. According to Imagineer Beth Clapperton, these were one of John Lasseter’s favorites. 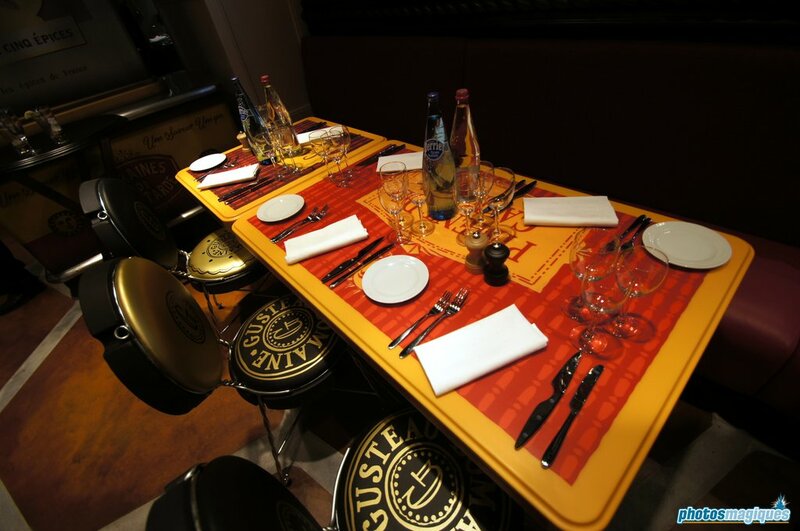 Little stools made entirely of cork are also present in the restaurant. Some of the tables feature large cocktail parasols. These were custom designed as well so that they could meet the fire code. There are also a few clever references. 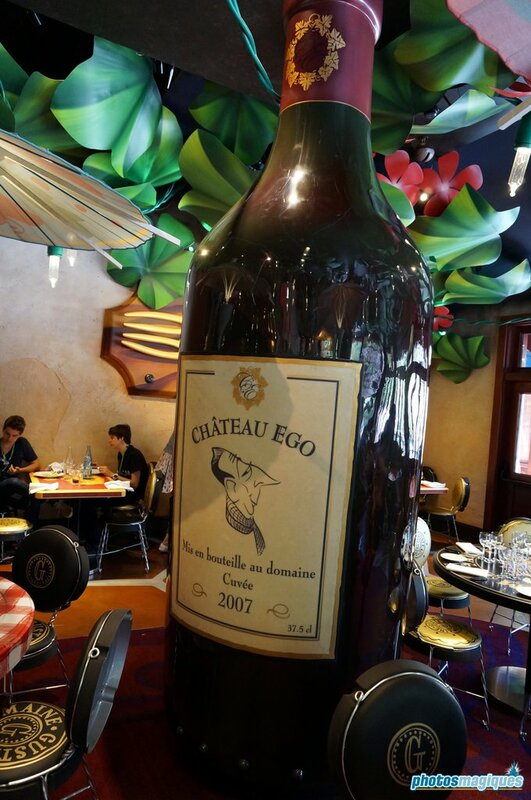 Among them are the two wine bottles in the veranda part of the restaurant. One bottle is from the year 2007 while the other is from 2014. It’s obvious these refer to the release year of the movie and the opening year of the attraction. 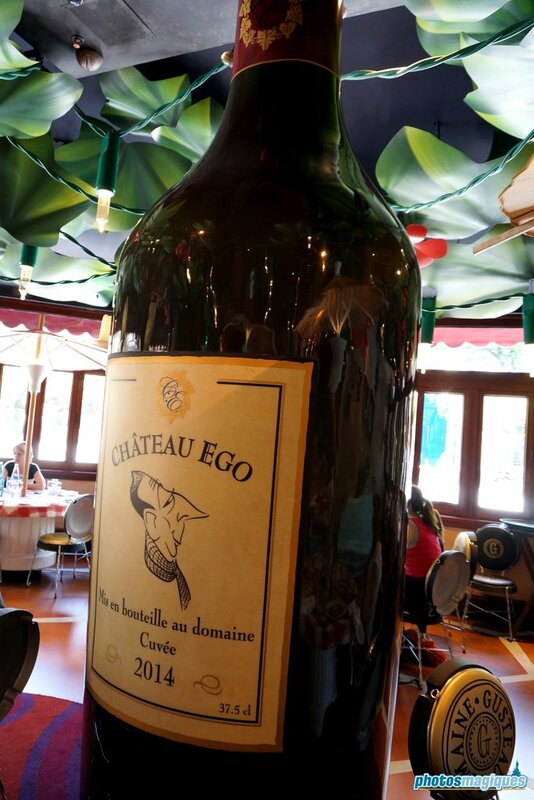 But one of the waiters gave it another twist: 2007 was the year when Rémy was discovered by restaurant critic Anton Ego and 2014 was the year he opened his own restaurant. In an effort to increase capacity of the restaurant and to make sure that there’s a good flow of guests entering and leaving, the menu has been made deliberately limited. 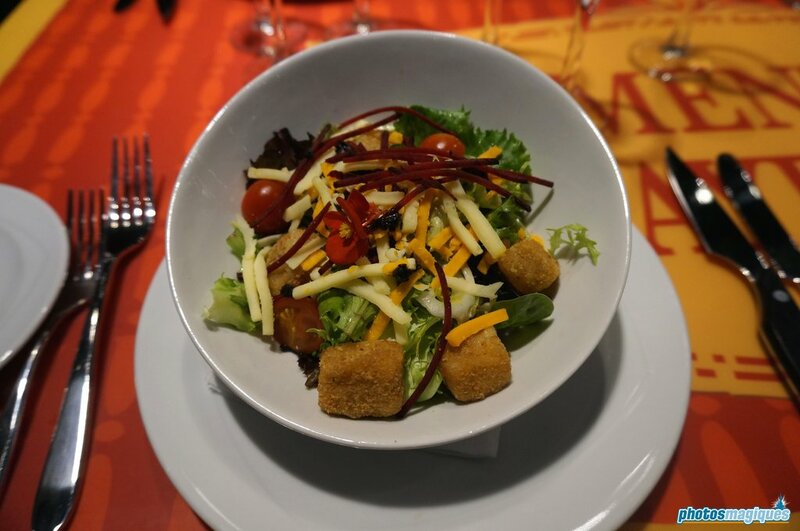 The starter is always a green salad with Brie croûtons grated cheese. 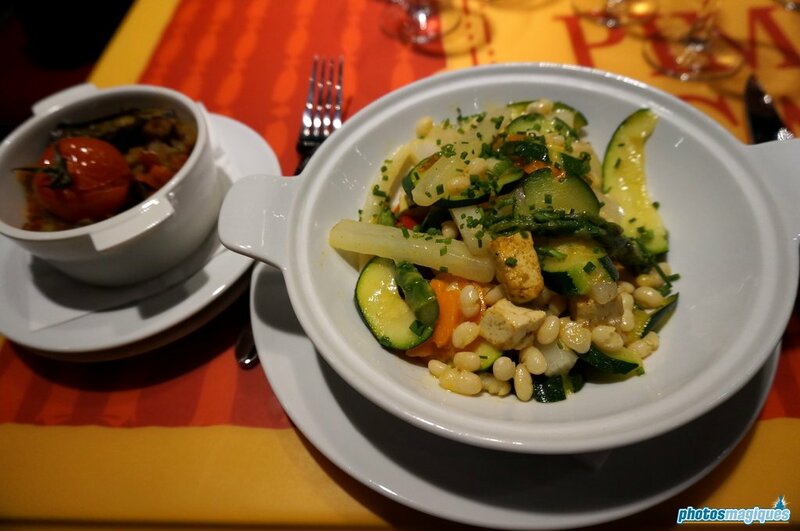 The main dish, and the specialty of the house, is entrecote served with chips, Chef’s sauce and of course ratatouille on the side. Alternatively, there’s also grilled cod and a vegetarian casserole with tofu. 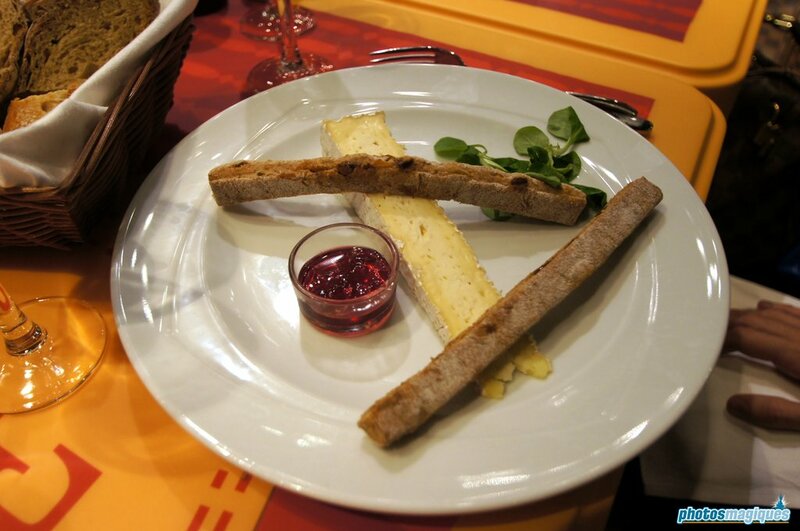 One of the desserts that can be ordered is Brie from the nearby village Meaux. 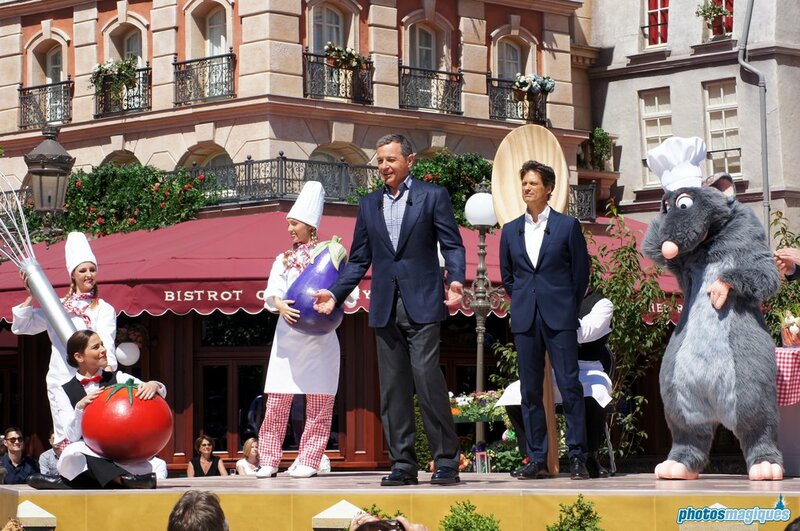 The way the restaurant is managed is almost similar how it’s done on the Disney Cruise Line. 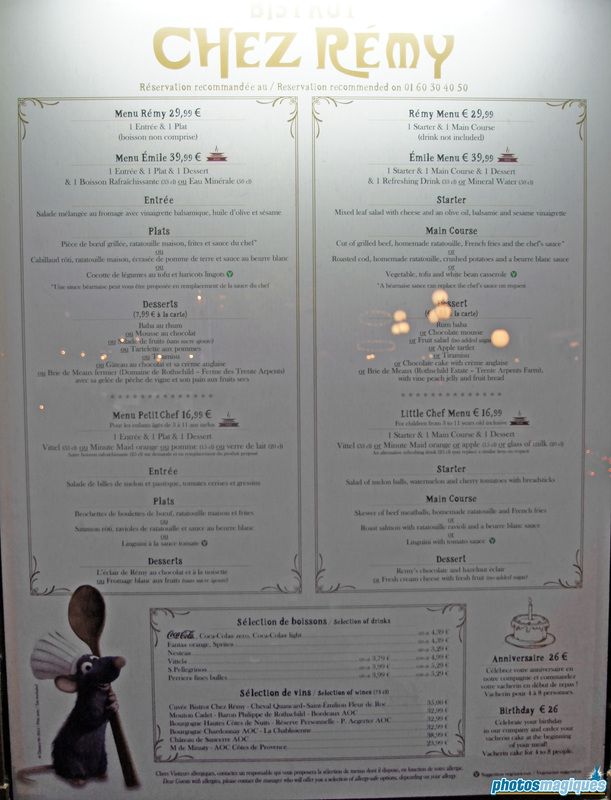 Click here to open the full Bistrot Chez Rémy menu in high resolution. 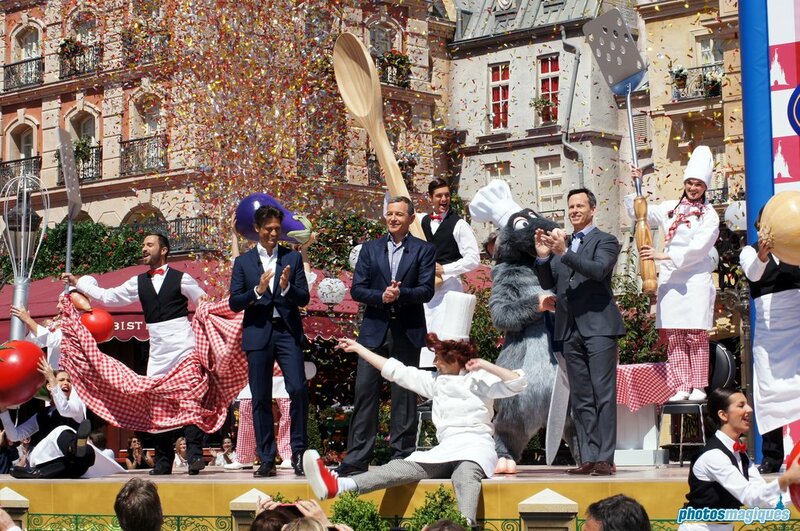 It’s recommended to make a reservation for Bistrot Chez Rémy by calling the reservation line (+33 1 60 30 40 50) or alternatively by booking at City Hall, Studio Services, at any Disney hotel reception or at the front desks of any other Disney table service restaurants throughout the resort. 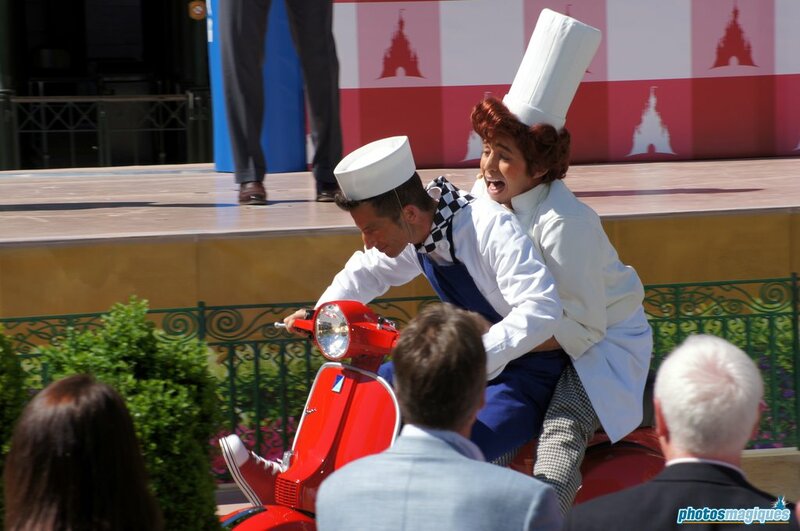 There are over 35 photos of Bistrot Chez Rémy in our photo gallery. Click here to check them out. Update: Brie croutons are not part of the starter salad. This was for the press preview only. 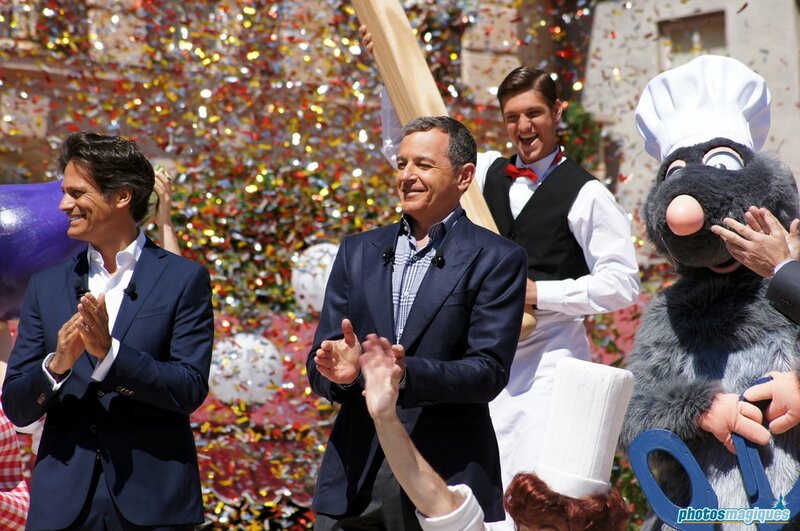 Ratatouille: L’Aventure Totalement Toquée de Rémy, Bistrot Chez Rémy and Place de Rémy were officially inaugurated on Saturday 21 June 2014 in presence of Tom Staggs – Chairman of Walt Disney Parks and Resorts, Philippe Gas – Chief Executive Officer of Euro Disney SAS and Bob Iger, Chairman and Chief Executive Officer of The Walt Disney Company, as well as the stars of the Ratatouille movie: Rémy and Linguini! Check out these photos, but there are 40+ more photos right here!